It was his second season with Barrie. In 2011, he became the second player to be granted exceptional player status to allow him to enter the OHL at age 15, a year earlier than other players. 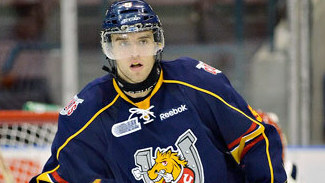 The Colts then selected him with the first pick of the 2011 OHL Draft. McKeown (6-foot, 186) made his OHL debut with Kingston in 2012-13 after being the second pick of the 2012 OHL Draft. In 61 regular-season games, he had seven goals and 22 assists. He also had one assist and a plus-4 rating in seven games to help Canada win the gold medal at the 2013 IIHF World Under-18 Championship. Two of McKeown's Kingston teammates and fellow top 2014 draft prospects also were invited to the camp: left wing Samuel Bennett and right wing Spencer Watson. Bennett, a 6-foot, 165-pound forward, had 18 goals and 20 assists in 60 regular-season games, and three assists in four playoff games. Watson (5-9.5, 155) was second on the team in 2012-13 with 23 goals and fourth with 43 points. Forty of the 42 players invited to the camp are eligible for the 2014 draft; defenseman Ryan Pilon from Lethbridge of the Western Hockey League and left wing Ryan Gropp from Penticton of the British Columbia Hockey League are part of the 2015 class. Pilon is the nephew of former NHL defenseman Rich Pilon.